The School of Music has its own purpose-built building complete with rehearsal, performance and practice spaces, a lab for studying the psychology of music and four lecture theatres. 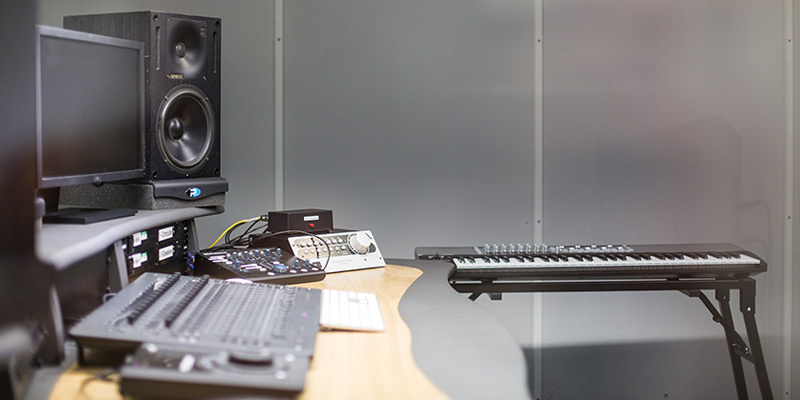 There is also a wide range of professional equipment and music software to help you with your studies, including studios for sound recording, software development and computer music composition. In addition, our instrument collection includes a specially commissioned gamelan, historic and modern keyboard instruments and a large selection of orchestral and world percussion. We have All-Steinway status, meaning that all 29 pianos housed, and available for use by all our students in the School, are Steinways. £742,000 was invested in the pianos – a combination of uprights, baby grands and concert grands. At the heart of our School is the Clothworkers Centenary Concert Hall, a performance space which hosts a large and varied programme of concerts in term time. As a student in the School you'll be able to go along to the concert series programme free of charge.